Now you probably are looking at the title of this blog and the title of this post and thinking how I could be writing an article about how to reduce the pain in paintball.I’d like to make the point that there will always be some amount of pain associated with the sport, and that some of this pain can be avoided, so for those of you looking to avoid a bit of it take a gander at the list below. 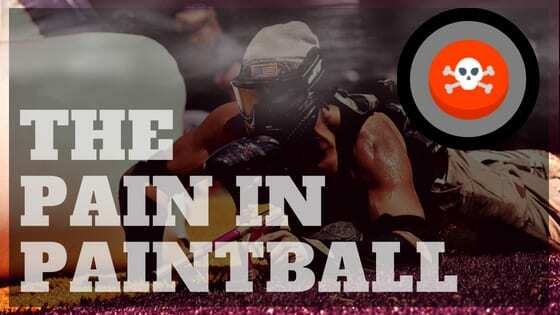 There are things you can wear and do before paintballing to reduce the pain, so keep on reading! 1. Wear layers… avoid wearing soft clothing like sweat pants and such because bounces hurt the most. You can slap on a pair of jeans over some sweat pants if you insist. 2. Protect the neck… wear a collared shirt to protect your fleshy neck, it doesn’t feel to good to have a ball bounce off of the larynx. You could get a neck protector too if you want the extra padding. 3. Your thighs of steel are actually thighs of pain. Getting shot in the back of the leg stings, turns out there are a lot of nerves back there. Slap on the compression or sliding shorts if you have them, oh do they help. 4. Take something before you play… I mean football players pop aspirin before they take hits, and if you don’t care about your liver then you are golden. Or you could just get hopped up on energy drinks and get your adrenaline going to the point everything becomes a blur. 5. Pack some rock hard muscles on your body… soft tissue is easily bruised tissue, so if you want to be able to play in a t-shirt get shredded so you can sport some natural body armor. 6. Gloves… there’s a reason why professional paintball players wear them, and it’s not just because they look cool. 7. Meditate before you play… there are monks out there that meditate and punch holes in walls without feeling any pain, if it works for that then it should work for paintball. 8. Become a ninja… no one can shoot a ninja. 9. Hypnosis… all it takes is one quick visit and your set for life, just make sure they restrict this to just being hit by paintballs otherwise you could end up with problems later on in life. 10. Change the way you think about pain… this one isn’t for everyone, but there are people out there that think pain makes them feel more alive. All you have to do is stop “hating” pain and start thinking differently everytime you get hurt. There you have it, ten ways to reduce the pain in paintball, use them wisely but remember, you can’t take the ‘pain’ out of ‘pain’tball.